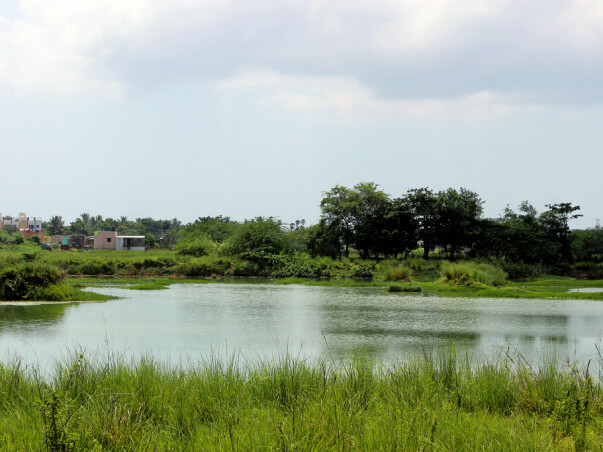 Sewage, garbage and partially treated wastewater now fill the once clean Perumbakkam lake. You will not believe it but, not long ago, Chennai had enjoyed salubrious environment and was known for its lakes and gardens. The undulating topography with underlined rock formations offered enormous scope & opportunity in developing several human-made small water reservoirs in and around Chennai. As per the revenue records the city had more than 300 lakes in the past! Unfortunately a rapid & unregulated urban growth has resulted in drastic reduction in their number but also caused incessant pollution/poisoning of remaining lakes. One such lake that has suffered is the Perumbakkam lake. The lake was a fully filled fresh water body of over 100 acres and a home to many species of fishes and other amphibians just 3-4 years ago. 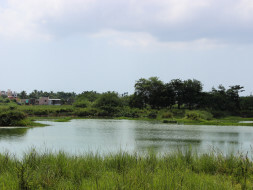 Ecologically, this lake played the key role in balancing the local environment of regulating the surplus flood waters during monsoon periods, keeping lake surrounding cool, recharging of ground water sources, nurturing wetland ecosystem and provides feeding & breeding grounds many local and migratory birds. Now, the lake banks are surrounded by a host of local small industrial and production units that regularly dump municipal waste into the lake and in a plot of land very close to the lake. The local and nearby garbage is also dumped close to the lake. Adding to this is the raw sewage that is let out by private septic tanker lorries in truck-loads. At least 20 tankers let out raw sewage every day! The current state of the lake has no semblance to the earlier self. It has become one-twentieth of its original size and is full of garbage and sewage. This, now, threatens the very existence of flora and fauna and severely threatens the health of people living nearby. The local communities along with EFI took up manual cleaning through the last year and made petitions to the government agencies. The good news is that after untiring follow-up, we have received permission to restore the lake using mechanize means using private funds. Conserving and restoring its fresh water status is an important task at hand. The entire project will focus on restoring the lake and reviving the lost biodiversity of the lake. This will ensure that a safe haven is created for the region’s birds, turtles and more. Also for the people in the locality the lake will become their social responsibility. This project will be a true partnership between local communities, EFI and like-minded individuals/entities. to dig a trench and lay a bund on the circumference of the lake to prevent future movement of vehicles into the water body. The entire expanse will be divided into zones and each phase will work on one zone. Each phase will be 35 to 40 days long and the entire lake will be completely done in 2 to 3 phases which will happen one after the other with no break in schedule. Chain Saw JCB, Earth Movers, Tipper Trucks. (Rs.1,700/Hr. 10 hours of work on a given day. There is extensive overgrowth of weeds across the lake and also large sediments of silt. To remove the silt and the weed machinery will be used. 1. First of its kind community based conservation project with a scientific approach. 2. Percolation trenches, “G” shaped central islands are all key innovation in restoration of the lake. 3. 18 members will get employment opportunity through the project, which includes a geologist, hydrologist, microbiologist and physical labour staff. 4. The awareness that would reach a potential 60,000 people in the neighborhood is expected to be a critical benchmark. EFI does not charge for its administration or overheads, all project costs mentioned here are for the restoration work only at current market price. The money will be spent only on the project. EFI will execute the project with highest scientific standards and have a common minimum program based on which the project will be executed. By cleaning and restoring a freshwater body we are building a bio-diversifie hot spot within the city. The Perumbakkam lake is much cleaner and greener than before. Without your support, the residents would not have achieved what they have today. Your support allowed the lake regain its biodiversity. This community came together to bring back the lake's lost sheen. They reached this far with your help. They are just a mile away to achieve Perumbakkam lake's fresh water status. They thank you for standing by them and look forward for your continued support. Click here to witness the impact you made.